So many education choices. Is there a difference? As parents make that determination, it's important to consider the family's goals and the potential benefits. OK, if parents can be honest, children do not always feel like the blessing that God says they are. But perspective puts things right. What will we think about in 10, 20, or even 30 years? Will we care about our ease and convenience, or will we rejoice at the character and depth of our children that is then passed along to one's grandchildren. Lake Pointe exists as a ministry to help parents disciple their children, and while that process demands much time, it's worth it -- and it is indeed a high calling and privilege. The University Model gives that time to parents and it also gives the opportunity. Families are in constant connection and conversation through educational activities, which allows parents to pass on their faith, their values, their love, and their work ethic. (From NAUMS). According to information gathered by pollster George Barna, the most critical period when 94% of all boys and girls come to a saving faith in Christ is before the age of 18, and 90% before the age of 14. Only 6% will make that decision to accept Christ between the age of 18 and their death. Since parents are the most influential factor in this decision, it is vital that models of education exist that keep parents involved with their children during the early, critical years of a child’s education and spiritual formation. While it seems like an intangible, isn't giving students a firm faith foundation for moral and ethical value decisions what college prep is all about? Why do statistics say that half of college freshmen drop out of college? It's not because they're dumb. Far too often it's because they lack the fortitude, the self-control, and the moral character to avoid costly mistakes. If a student has weak academic skills that lead to challenge and frustration, many simply give up. Lake Pointe graduates have benefit from academic rigor, biblical integration/ application, communication skills, and the development of thinking and perspective. This allows them to consider various viewpoints and to weigh each in the balance of truth, as they make right decisions. As to self-discipine, LPA students have already been following a college-like schedule for years! Walking with a parent's help and then independently, these students are already familiar with the two sides of university study -- class attendance and working on studies outside of class. They are more than ready for college. When Lake Pointe students reach the college campus, they stick, and that is a major ingredient for success. (From NAUMS) The chart above shows the academic benefit of gradually preparing students for college entrance. On the left side of this diagram is the number of hours each week students are in a classroom guided by a professional teacher. On the bottom, from left to right, are the ages of students up to 18, the typical age for high school graduation. UMS students don't need a big adjustment to independent self discipline; they have been living it. 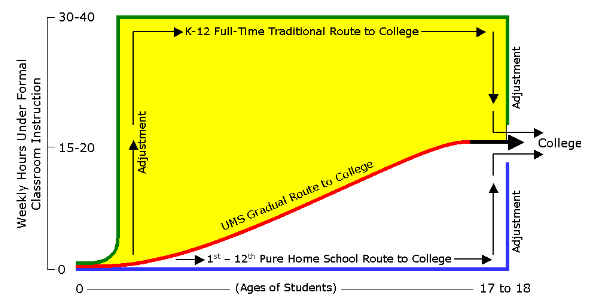 The diagram's yellow portion also hints at the additional time the University-Model® gives back to families.